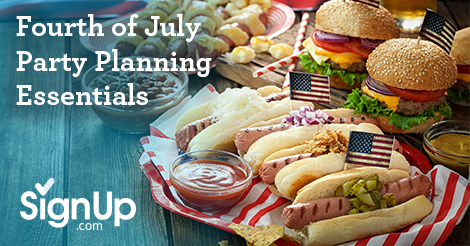 The July 4th Party can be your easiest party of the year –and with a little planning, it will be one you get to enjoy along with your guests! Use these tips for a foolproof Fourth! Décor: Keep the decorations simple. Anything in red, white, and blue is perfect! If you are using disposable napkins, plates and cutlery, buy them in red white and blue. Use tablecloths in red, white and blue solids or patterns. Anything that plays on the ideas of “stars and stripes” is welcome—a striped red and white tablecloth with cut-out blue and white stars is as complicated as it needs to get. Food: Set out a buffet style meal. Think simple and classic and—most importantly –easily done ahead of time. Grill burgers and hot dogs ahead of time. Slice the veggies for the burgers before your guests arrive. Make sides of macaroni and cheese or potato salad ahead of time, too. Plan for your vegetarian friends –throw some extra veggies on the grill and make sure you have a big salad. If you want to take the food up a notch, add some custom flair by making your own barbeque sauce or adding an unusual twist to the side dishes, such as lobster meat to the mac and cheese. Serve blueberries and strawberries and apple pie for dessert. Don’t forget the littlest guests—peanut butter and jelly sandwiches and sugar cookies in the shapes of stars will please the non-burger or hot dog eating younger set. Drinks: Visit a dollar store and buy big plastic bins in red, white and blue. Fill them with ice, bottled water, soft drinks, beer and wine. (Keep the beer and wine separated from the containers where the kids get their drinks!) Use red or blue plastic cups, which can be recycled, for the wine or those guests who prefer to drink from a cup. Trash and Recycling: Line big trash cans with several layers of plastic trash sacks. Then, as the trash fills up, simply take the top bag out, tie it up and take it to the trash. Label bins for cans and bottle recycling. In the kitchen, label plastic bins for plates, cups, and cutlery so your guests can help with the sorting and you don’t end up with a sink full of dirty dishes. Activities: Although you don’t really need activities for a July 4th party, if you have access to a swimming pool, that’s always fun. (Hire a neighborhood teenager to be the designated watcher/lifeguard.) Plan for fireworks watching if that’s available in your neighborhood—if not watch them on television! Rain Plans: This party can be given inside or outside, although outside is preferable and makes for easier cleanup.